In which we learn that every once in a while, with perhaps a bit if GM encouragement, Blades might actually try to make a difference and make things better in Doskvol. They’ll do it by kidnapping rich people’s (adult) children and holding them ransom, but they’ll do it to make a difference! Creating Change. You believe in the cause. Who do you care about and how have they suffered? Who needs to go down for things to change? What will you do to them? Ask the Creating Change. You believe in the cause. Who do you care about and how have they suffered? Who needs to go down for things to change? What will you do to them? Ask the GM how they are prepared for you. Before this game everyone who read that option said some variation of “hah, as if!” and them moved onto one of the other two more self interested options (Smoke Screen and Supplying one Side). 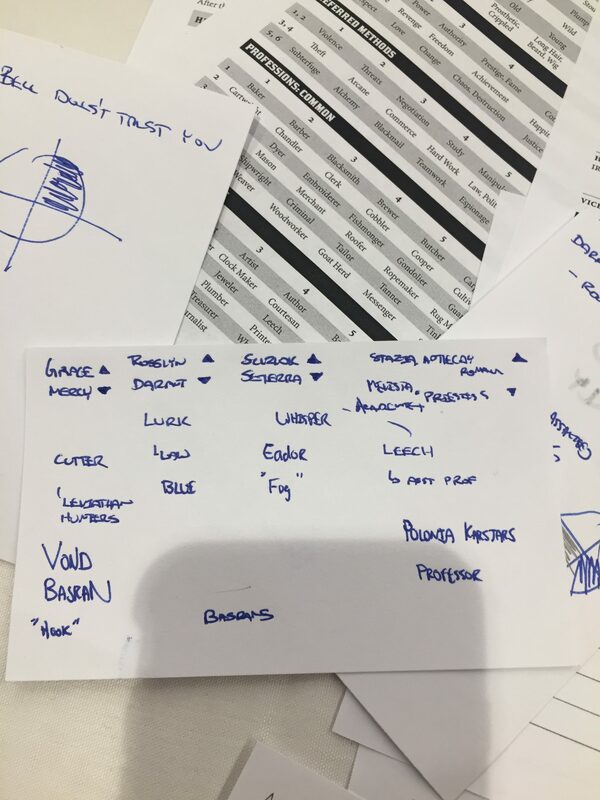 However when Mike Olson was deciding which option to take (we pass the sheet around the table allowing people to make choices and then others to answer the question in italics) he actually considered choosing that option and with a bit of a nudge he went for it! The Coalridge Minors have been trying to form a union for years, and union breakers (like our crew here, the Sword Kids) have been making sure that didn’t happen. Under the employment of Foreman Slane, they’ve been leg breaking and fire making to keep would be organizers from… organizing. But that changed when Bell Brogan, a noble who gave up her life of luxury to join the coal miners and organizing them to throw off the shackles of their cruel employers, started causing trouble for Foreman Slane. To shut them down Slane had the Sword Kids light fighter to a building known to house many of the coal miners. Few were hurt in the fire it (it was lit while everyone was at work) but all of these families lost their homes and their possessions. Slane meant it as a message, to turn the tide of dissidence, but his actions were only fuel on the fire! Meanwhile, Slanes employer, Laudius Bowmore arrived on Coalridge announcing a relief effort to help all the now homeless members of Coalridge. He and his family were also going to host a town hall to hear all of their grievances. The Sword Kids however, knew this was all for show. 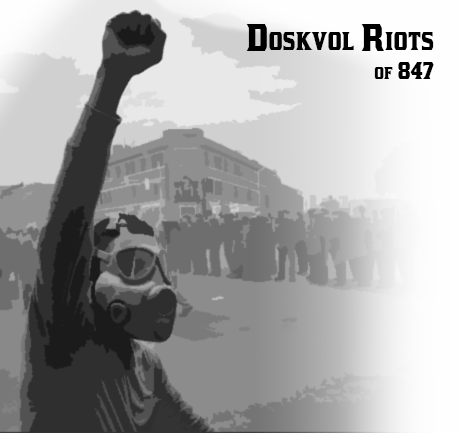 The Bowmore’s didn’t care about the people, they just wanted to quell the rioting. They would make empty promises that would never be filled, and once again convince the miners that their best option was to go back to work, accept what meager scraps could be offered to them, and in all other ways accept a worse life than they had before. Bell, who was actually part of a noble family, grew up with Adric Keel, another noble whose parents never expected anything of him, but who wanted to make a difference. Much to his parents dismay, Adric joined the Bluecoats, and because of his lineage, was instantly appoint as a watch commander. Because he didn’t spend much time on the street, it took him a while to realize that the Bluecoats were just criminals with a chain and a fancy coat. And when he tried to expose the corruption he found it went all the way to the top. He also found out that the squeaky wheel gets the grease hammer. He was kicked off the force and disowned by his parents for being such a disgrace. Adric, who had been given the name “Blue” by every criminal on the street who still thought he was a Bluecoat at heart hooked up with his drug dealers (hey, he might want to make a change, but that doesn’t make him an angel) Timoth, who in turn brought along two Skovlanders, who smuggled the drugs, Skannon and Brace. This sad lot had all been beaten up by Doskvol in one way or another. Brace was a Skov refugee that got gang pressed onto the Nightbreaker, Lord Strangford’s notoriously dangerous to crew Leviathan Hunter. Skannon, who had fought beside Brace in the Unity War, signed on voluntarily to get him off the ship, but needed both Blue and Timioth’s help to do it. Since then, the Sword Kids had fallen in with Foreman Slane, doing work Adric never thought he would, until it went to far and they turned against their employer. Convince the housekeeper not only that she should stay quiet but she remembered Adric from when he was young, and that “I didn’t set out to do crime” but now crime was the only way to make thinks better, and that she should help them escape the house with the two paralyzed Bowmore’s in tow. Create a fantastic explosion as a diversion to distract the rioters outside and sneak to a boat which they had waiting nearby to sneak away with the price. I really liked the use of clocks in this game. We had several tensions rising around the people being mollified, Bell being assassinated, and, Bell who they called a friend, learning that the started the fire. I was particularly impressed that when the “Assassinate Bell” clock was 3/4 full, Timoth called for that flashback to warn her that they were about to do something dangerous and that she should watch her back. It caused all kinds of tensions between them (she wanted to lead the resistance) but with a lot of work they won her over and knocked that clock down and kept her alive. There was some really morally grey areas here, but I wanted the players to decide where the stood. This was the first group I’ve seen that actually said they wanted to do some good, and it was great watching them try despite how hard it was. And even then, poisoning a noble’s children and kidnapping them, it’s hardly behavior that you can excuse, but to them it was for a greater good. I wouldn’t call the Sword Kids “good” people, but having the discussions they did in game (and in character) was really wonderful. The crew’s name came as this off handed comment. Something like “Do all you kids have swords?” and then it just turned into, yeah, we’re the Sword Kids. And boom, crew name! I felt like I got really good hooks in the game for Adric/Blue, and towards the end for Timoth, but not so much for Skannon and Brace. I think it’s an easy crutch for me in a con game to grab onto one character’s heritage or background and play off that, when I should really be doing a better job of incorporating them all in.